I recently had a chance to get behind the wheel of the 2013 Hyundai Genesis Coupe in 3.8 R-Spec for a short test drive and while I would have loved to spend more time in this powerful Korean sports car – the seat time received was more than enough to show how far the Hyundai performance program has come. The most noticeable change for the 2013 Hyundai Genesis Coupe is the sharpened exterior, which offers an even more aggressive form of the distinct Hyundai exterior styling. The 3.8 R Spec package includes 19” wheels wrapped in high performance tires, a Brembo braking system package, a reworked and track tuned suspension system, a Torsen limited slip differential, a 6-speed close ratio manual transmission and (most importantly) Hyundai’s 3.8L GDI V6 packing 348 horsepower and 295lb-ft of torque. This engine offers an increase of 42 horsepower and 29lb-ft of torque compared to 2012 model year vehicles which, in my opinion, is the most exciting change for the 2013 models. Our drive wasn’t long enough to really see what kind of fuel economy numbers the new Genesis Coupe 3.8 R-Spec offers but the EPA has it rated at 18mpg around town and 27mpg on the highway for a combined figure of 21 miles per gallon. Unfortunately, I so enjoyed exercising the 348 angry ponies packed under the hood that I am sure that my test 2013 Hyundai Genesis Coupe wouldn’t have gotten anywhere near those predicted fuel economy figures. 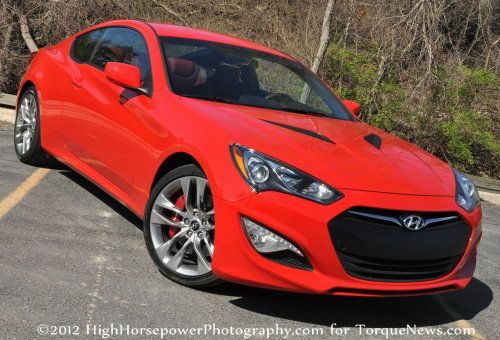 When you climb into the 2013 Hyundai Genesis Coupe 3.8 R-Spec you are greeted by an interior with bright red seats and door panels accompanied by a black dash, carpeting and trim. The Genesis Coupe has a smaller feeling than the other popular rear wheel drive performance cars but it offers plenty of leg, elbow and headroom for the driver and passenger. As you fire up the 3.8L V6 it sounds like a fairly mild mannered motor with less idle grumble than you’ll get from the competition but when you climb into the RPMs, the revised V6 really screams. Best of all, while many performance enthusiasts shy away from the high pitched, nasal sound of tuned V6 engines – the Genesis Coupe 3.8 has a much deeper, more muscular tone. When our drive of the 2013 Hyundai Genesis Coupe 3.8 R-Spec began, we were tolling around the congested public roads around Metro Detroit and the Korean sports car was comfortable and smooth as we worked our way through traffic. The Gen Coupe is easy to drive, with a clutch that is easy to learn and felt as though it would be pretty forgiving for someone who is not so great with a manual transmission. We did get a few chances to launch the 2013 Genesis Coupe hard from stoplights and when we did, the 3.8L V6 sat us back hard in the seats with just a shade of wheel spin followed by an impressive dash up to 60 miles per hour. Shifting hard from gear to gear was smooth and the gears were easy to find even before we got a decent feel for the transmission. A few stoplights stomps in the 2013 Genesis Coupe were fun but when we got into the twisty back roads, we really got to appreciate the performance capabilities of the revised Hyundai sports coupe. Whipping through the back roads of the area, the Genesis Coupe felt light and nimble with very little body roll, while the 348 horsepower V6 was willing and ready to help us tear out of the tightest turns and back up to speed. The stiffened suspension of the R-Spec package allowed the Gen Coupe to feel very confident around both short, tight turns and longer, sweeping turns – all in all providing an impressive, sport drive. The steering system is tight and very responsive, helping the Hyundai sports coupe to be able to smoothly cut through tight s turns and when we ran into turns too tight to make at speed – the Brembo braking system gets the Genesis Coupe stopped in a big hurry. Hyundai might be more well known for their fuel sipping economy cars but even a short drive in the 2013 Hyundai Genesis Coupe 3.8 R Spec makes it clear why the booming Korean automaker should be considered by those looking for an affordable, efficient sports car. This is a sports car that will put a big smile on your face whether you are racing down the highway or cutting through a bendy back road with enough low end acceleration to put this Korean sports coupe into the 13 second quarter mile range. At the end of the day, the bottom line is that the Genesis Coupe 3.8 R-Spec is a great deal of fun to drive with a fairly plush interior for an affordable sports car.